We are the Borg. We will add heat and distance sensing to your vision. [Gregory McRoberts] was born with reduced vision in one eye and has never experienced the three dimensional sight which most of us take for granted. Recently he was inspired by the concept of a hearing aid to build a device which can augment his vision. Behold, the very Borg-like eye-patch that he wears to add distance and heat to his palette of senses. The hardware he chose is an Arduino-compatible Lilypad board. It is wired to an ultrasonic rangefinder and an infrared sensor which monitor the area in front of him. The function of his right eye is still capable of seeing light and color, so a pair of LED boards are mounted on the inside. One is connected to the thermal sensor, displaying blue when below eighty degrees Fahrenheit and red when above. The other LED is green and flashes at a different speed based on the range sensor’s reading. This is distracting when a person with normal sight wears it because of the intensity of the LEDs. We found [Gregory’s] explanation of this (called Helmet Fire) quite interesting. The Halloween hacks are rolling in late this year, but we’re delighted to see that [DJ Sures] finished his borg costume in time. It is made up of a hodge-podge of items from different cultures… oh wait, so are the borg. These include a set of hockey pads spray painted black with just a light misting of silver to give them some depth. 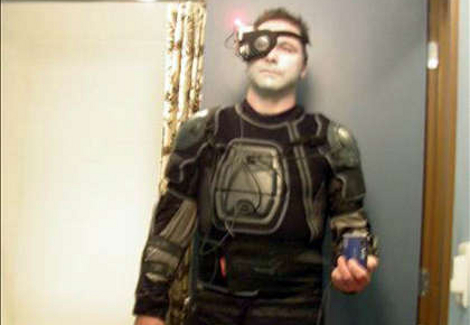 After taking the image above (which mostly shows off his makeup) [DJ Sures] added an LCD screen to the chest plate and lighted electronics throughout. See for yourself after the break. If you liked this you might take a look at his singing spark plug. This is not the most difficult mod ever, but digg loved it enough to kill Ben’s site before I could post it yesterday. Ben’s been doing a slate of consignment mods lately. 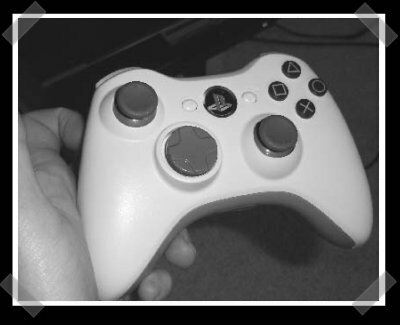 This time he stuffed the guts of a PS3 six axis controller into an Xbox 360 controller body. Ben’s starting to act like a XBox 360 borg… His site is back up for now, but it’s awaiting some dns updates as it moves to a sexier hosting plan. Look while you can. After declaring our independence last fall, complete site autonomy seemed like the next logical step. Using some clever coding we have developed a system that will let Hack a Day run without any intervention. The first layer in this system is topic selection. All tip line submissions are sent through a series of filters. These look for keywords like “firmware”, “POV”, “microcontroller”, “video”, “linux”, “WRT”, “GPS”, “PCB”, “TLA”. Each submission is given a l33tness ranking based on these words and the best tip is immediately thrown away. The second highest link is then passed through our advanced anti-duping engine that confirms the link hasn’t been posted in the last week. The post text is generated using Markov chains in what top scientists suspect is a miracle. The story is then automatically cut and pasted into Digg without credit. To foster discussion the reader comments are automatically seeded with “first post” and “this is not a hack” on every post. This system is implemented using a large quantity of duct tape (code and literal) on our brand new Linksys WRT54G beowulf cluster. We hope this system serves you well. We’ve been working on an “auto-hacking robot” to generate how-tos as well, but on its test run it instinctively disassembled itself.